Happy Friday everyone. Another week is winding down and it is almost April. I am ready. :) This has been a tough March here in New England with a couple of accumulating snowstorms and lots of cold and grey days. Speaking of snowstorms, we have one coming tonight into tomorrow. 5-10 inches are predicted, which is a big storm in February never mind on April 1. Maybe we'll see bare ground by May 1. But it was a fairly fast week for me. I'm not sure what I will do this weekend with the snow coming, but I am signed up for an art class tomorrow morning if the weather should cooperate and I still want to go see Beauty and the Beast at the movie theater. So today I went Southwest for my journal page. These large cacti are called saguaros and I think they are fascinating. 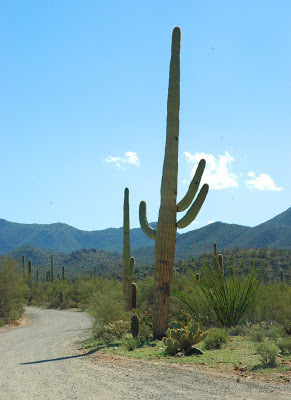 They can grow really tall- like a 10 story building (or more) and when you have a lot of them they form a saguaro forest. They can live for over 100 years too. Here in the US they are found mostly in Southern Arizona, and several years ago I got to go see them. I had fun painting this page. I worked backwards because I made the cacti first and then I went and did the background. 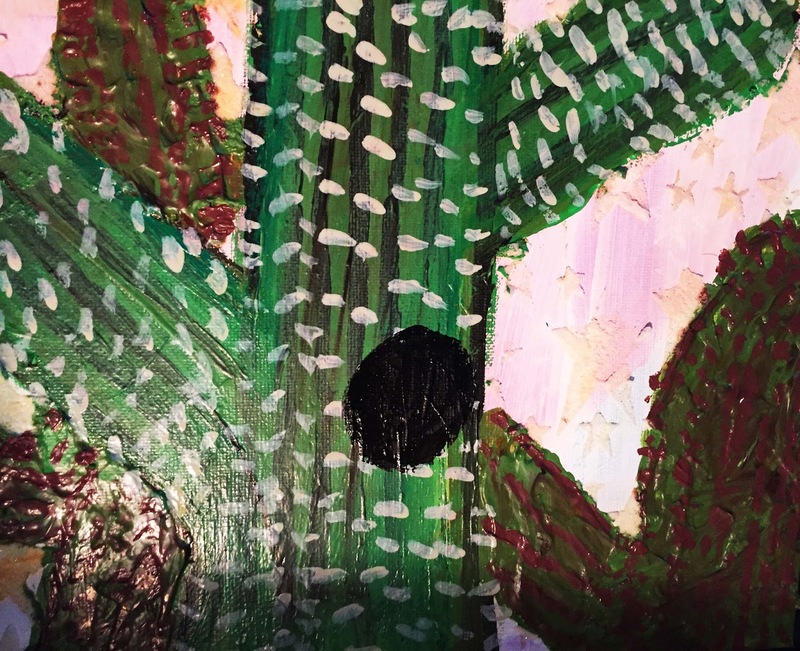 I had so much fun I decided to paint some saguaros on a canvas. 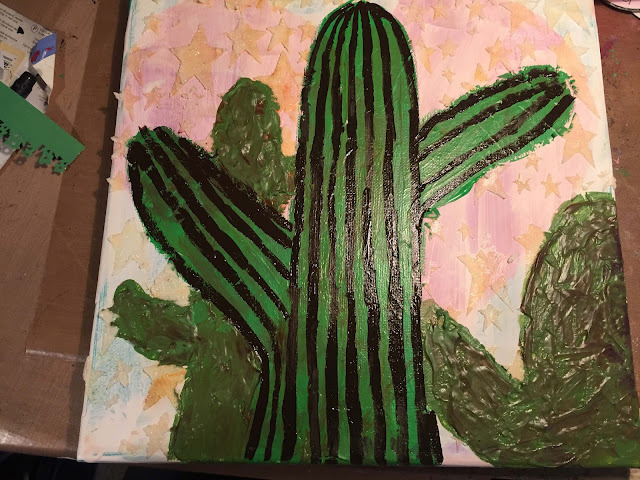 I had started a painting I truly disliked, but the background had some great coloring, so I painted my cacti over that and then added some molding paste stenciled stars. I decided to leave the background colors just as they are. I'm not done yet, because I want to add an owl like I added to my journal page. Maybe some details on my spines too. Owls do make nests in these huge cacti which I think is pretty amazing too. One last link up to Yvonne's great theme over at Art Journal Journey. Today is the last day to go Out and About. Great you have these cactuses on the paper ;-) I like very well. Can not imagine that here the owls make nests? They are definitely protected! I knew cacti could be tall, but never realised that that height. I must be thinking of the small ornamental ones we see for sale in our garden centers here in the UK. Its a fabulous page and painting today and I love how you added the sweet owl. Thank you for all the fantastic pages you have added to my theme choice this month Erika. I hope your weather doesn't stop you from getting to your art class at the weekend. 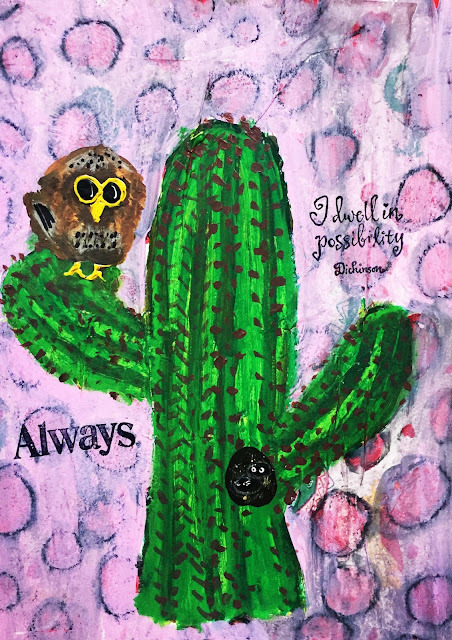 I've seen the saguaros in the desert, and your painted saguaros are beautiful. I like the photo you shared, too. Brought back wonderful memories. I hope you have a wonderful weekend and you don't get as much snow as predicted. We are under a flood warning through Sunday. EVERYONE, even those who have sump pumps, have water in their basements. Those cacti are fascinating - wow - in reality ( on your photos ) and on your page and canvas! I love this little owl you added! I feel with you in New England... not so nice to have such a long, long winter this year. Wish you a good weekend with the new film and maybe at the artclass! Enjoy! Thank you for all the wonderful entries you linked this month again to Art Journal Journey! You made me happy again and I didn't mention yet that your header is just AWESOME! Great painting and page Erika and an interesting read. and thanks for the nice comments on my last post. Oh, I hope that snowstorm is just a figment! You must be even more ready for spring than I am -- and that's plenty. We're just getting rain! But your fun cactus is a nice reminder of warmer weather. I can see why you had fun with it. Magical and yes, you capture prickly but the colors are so happy I just want to hug it! Tjhe saguaros are monumental! I have visited southern Arizona and I love the dessert landscape. Well worth doing a journal page about. You did great on the cactus painting. And I love your new header! Spring! Yes, it has been too drab for too long! I would have thought the owls would get jagged by the cacti. Isn't nature wonderful - as is your painting. The sweet owl looks quite settled there. Interesting that you painted the background after the cactus, I am never sure what order to do it in, I suppose it depends on the kind of paint and painting. The cacti make me feel warm on this cool/rainy day :) I like it!